The most important bit of equipment will be your boots. Some people will opt for trekking shoes or even trainers, but we do not recommend these as they do not offer ankle support and offer no protection from the rain or should you encounter snow on the trail. Your boots should be three-season and not cheap high-street boots. 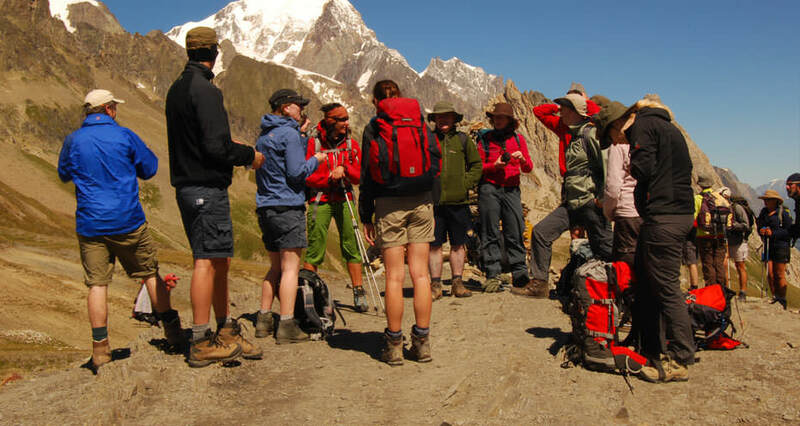 Good quality leather or fabric walking boots are recommended and you should make sure that they are worn-in before you arrive at the start of the trek: new boots can give you blisters and bad blisters can quite literally stop you completing the trek. Although all the magazine and brochure shots show trekkers in shorts and T shirts on the Tour du Mont Blanc, the truth is that you may well come across rain and even some snow at the highest passes. Rain storms can arrive either as frontal rain from the Atlantic (and the Mont Blanc range is the first big mountain it hits!) or late afternoon storms that build up during a hot and humid day. Frontal rain tends to be colder and so you will need all the protection you can get. On average you should expect two days of rain on your TMB. Consequently you want to be carrying good quality waterproof jacket and trousers. These should be made with a modern waterproof, breathable fabric such as Goretex or e-vent. You should avoid cheap substitutes or nylon outers that will make you sweat and ponchos are not much use, particularly if the rain is heavy. If you get wet – and cold – it will make your day miserable and possibly dangerous. You should come prepared for a range of temperatures, even in one day, and a range of conditions that might include a bright sunny day, a cold clear and windy day or a rainy day. The high mountains can throw a range of conditions at you, even if you are only on the TMB for a week: you need to be prepared. A selection of T shirts, shorts, walking trousers or skirts, one or two fleece jackets or pullovers and good walking socks are essential. In addition, you need a sunhat, sunglasses, warm woolly hat and gloves. There are no laundrettes on the trail and so the best you can do is wash your clothes in the hotel basin. It is best to bring at least enough spares, if not a few more. You should not need a down jacket as the temperatures do not drop too low at night, though some people like thin goose-down gillets which can be nice in the evening. If on a Guided trek, the leader will have a First Aid Kit, emergency shelter and mobile phone and so you don’t need to bring these. Hotels provide towels and bedding. In the refuges they provide duvet covers and pillow, but not towels.